Define PORTRAIT for younger grades and be sure older grades have a correct and clear definition. This Packet is a great one for making a Timeline showing the length of time between the lives of the different artists. It covers a long period of history and the things happening during and between the years of these artists are significant. Include major happenings in the world’s history on your Timeline. These artists also come from various countries (Italy, Holland, France, and later Tahiti for Gauguin). Throw in some geography by finding these countries on a map. Line up all of the Portraits across the board at the front of the room. Be sure to compare the various STYLES of the artists. Define EXPRESSIONISM and REALISM. Have the class decide which portraits are an example of EXPRESSIONISM and which are REALISTIC. • Ask the kids to define the word Portrait. Picture of a person. It can be a painting, a drawing or a photograph. • Does the painting show a certain mood or emotion? What clues tell you this? • Does the painting have detail or does it just give an impression of someone? • Does the painting look real or not very real? OR Is this a Realistic or Expressionistic painting? What are the clues? • Is the person’s name mentioned in the title of the painting? • What do you “see”, “hear”, “feel”, or “smell” in the painting?  Are there any painted portraits (watercolor or canvas) or reproductions (printed copies of paintings) hanging on the walls?  Any portrait engravings? Check the money in your wallet or piggy bank. (Display a dollar bill to the class) The portraits of the Presidents and Benjamin Franklin, which are found on paper money, are engravings.  If the person wanted to dress like a student or teacher in your school, what kind of clothes would they wear?  Would the look of the painting change drastically if the person were dressed in those kinds of clothes?  Are there any clues to tell you when this painting was done or where this person lived? This packet is a very good one for discussing arts styles from various artists and times (*See EALRS for elementary visual art). The pictures could be displayed at the front of the room and comparisons could be made as to the artists’ choices of COLOR, MOOD, BACKGROUND, and REALISM. 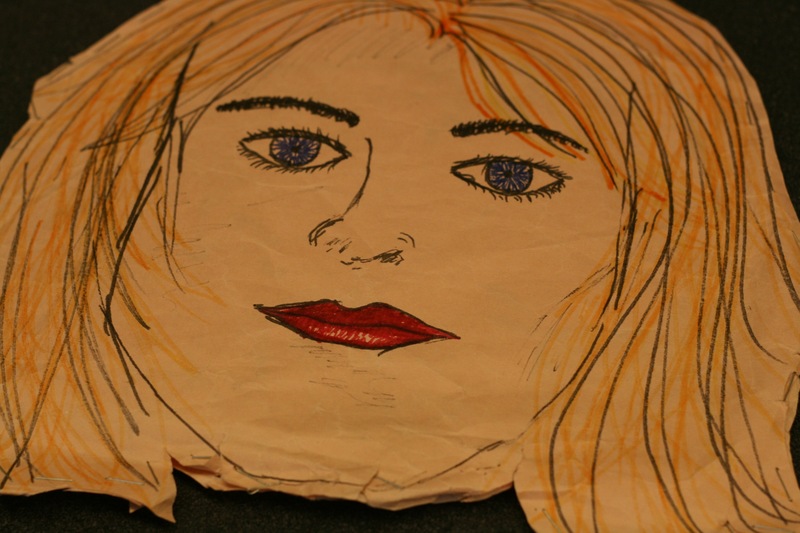 • Have students sit in pairs to draw or paint portraits of each other. • A variation of the above activity would be to have students sit in pairs and draw half of a portrait of their partner. When the first half is finished, trade with the other person and let them finish the other side of the portrait. The partner should do their best to copy the style of the original artist. The goal is to make the other side similar but different than the first side. When the other half is drawn, give the portrait back so the original artist can paint or color it. Both artists should sign their names on the art. • Cut out photo portraits from magazines. Cut the portraits in half vertically. Glue a single half to a piece of white paper. Pass out these “half portraits” to the class. Kids sketch the missing half of the portrait on the paper. • A variation of the above activity would be to have kids cut a photo of themselves in half vertically and draw the other side. 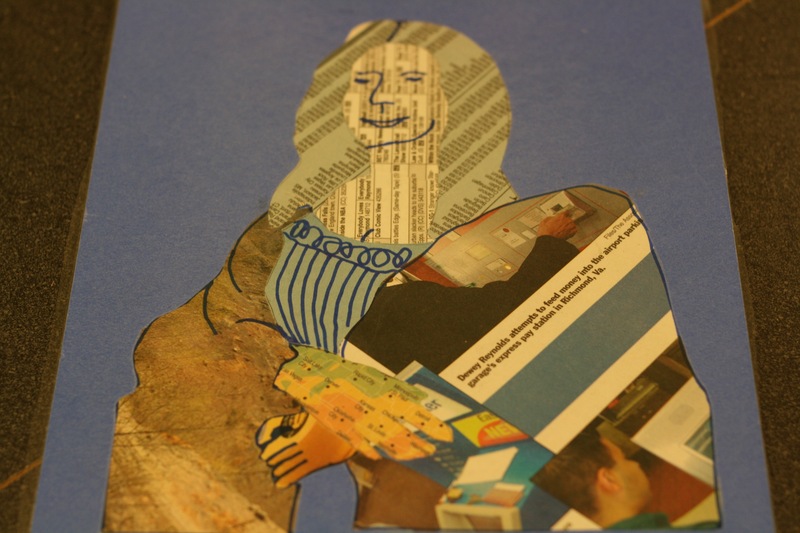 • Create a cut paper self-portrait. Cut details from paper such as eyelashes and eyebrows. All details should be cut from paper, and NOT drawn. 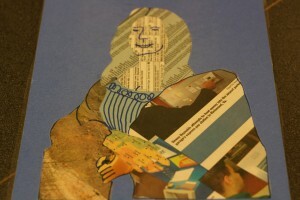 • Create a portrait using printed newspaper or old phone books. Have kids look through a pile of newspaper to notice the different PATTERNS (created from differently sized print and differently arranged columns) and COLORS. The “classified” section has a plainer type PATTERN that makes a good background for the face. Darker sections of the black and white photos can be cut in smaller pieces and glued close together to create dark hair or clothing. Larger headlines cut into strips can create “strands” of hair. These can be cut and layered to create an interesting hairstyle. The “yellow pages” of old phone books make great blonde hair and colored advertisements could be used for clothing. The other pages of the phone book have their own distinctive PATTERN. The eyes, nose and mouth should be cut from newsprint with different patterns than the face so that they will be seen when glued to the background “skin”. The center of the eyes can be cut from dark or colored paper sections. The plain borders of the newspaper (without print) make good “whites” of the eyes. Lips could be either darker paper or red colored advertisements. Leonardo da Vinci was born in the little town of Vinci, near Florence, in 1452. The artist used the name of this town for his last name. The artist was raised by his grandfather. As a young boy, and even as an adult, Leonardo was curious about life. Young Leonardo was always interested in learning about everything. Beginning as a boy, the artist kept sketchbooks with drawings of plants, flowers, insects, birds, and animals. His drawings helped him study and learn about things. Throughout his entire life, Leonardo kept sketchbooks filled with drawings of interesting people, ideas for future sculpture projects, detailed illustrations of human anatomy (muscles, bones, organs, etc. ), and drawings for future inventions. This artist even sketched a design for a submarine hundreds of years before the first one was ever built! When he was a teenager, between the ages of 13-15, Leonardo’s father took him to Florence to become an apprentice of the famous painter and sculptor, Andrea del Verrocchio, for three years. By the age of 25, Leonardo was famous as both a painter and a man of science. Leonardo felt that painting was “the supreme form of art”. His most well known paintings are the Mona Lisa and the Last Supper. Leonardo used what he learned from nature and science to make his paintings look real. He painted beautiful portraits and his strokes were so smooth you can hardly see a brush mark on the canvas. Unfortunately, many of Leonardo’s paintings were never finished. The artist used dark shadows and highlights to help give a realistic feeling of depth to his paintings. Leonardo would not settle for a painting that was less than perfect. He would spend years working on a single painting, so he did not produce many works. In fact, only 17 of his paintings have survived and some of these are not finished. Leonardo lived alone all of his life. In 1517, the artist became paralyzed. King Francois I of France invited Leonardo to live with him in France. In the small Chateau of Cloux, Leonardo enjoyed great honor and the esteem of the king and court, filling his last years making notes and drawings about his lifetime of learning and discoveries. Leonardo died there on May 2, 1519, at the age of 67. 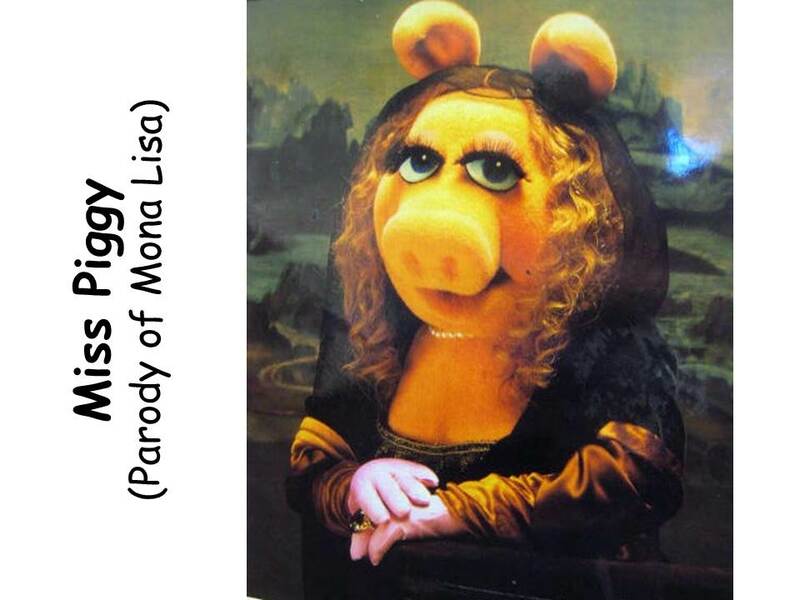 • Draw and paint your own version of Mona Lisa. Update her clothing or her hair. She might be “fluffy and frilly” or a 1960’s flower child “Hippie”. The background could be very different and modern. How about skyscrapers and freeways? Rockets and Satellites? Let your imagination go wild! 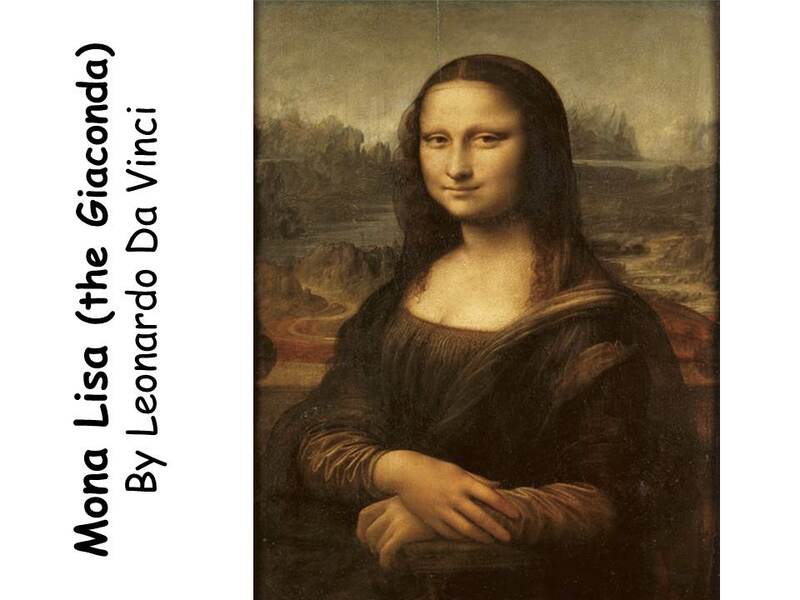 • Study this portrait carefully to help you finish drawing the other half of Mona Lisa’s portrait. • Create nature sketchbooks and draw a Self-Portrait on the cover. Like this artist did at your age, fill the sketchbook with drawings of plants, flowers, animals and insects. Rembrandt was born in Leydon, Holland, in 1601. He was the son of a well-to-do miller. Rembrandt’s father sent him to collage at the age of 14 but Rembrandt brought home more sketches than schoolwork. At the age of 17, Rembrandt’s father finally allowed his son to study art instead, but after six months, young Rembrandt left art school to develop his own style. By the time Rembrandt was 21, he already had several students, was well paid for his portraits and in high demand. His success continued for many years until he reached the height of his powers and success in about 1640, when he and his wife moved into a very grand home. Rembrandt had taken on many students and was an extremely successful portrait painter but, in spite of his large income, he began to pile up debts. Although he had reached great fame and success in the 1640’s, the decade was not very happy for Rembrandt. The artist’s son, Titus, was born in 1651. Titus was the fourth child of Rembrandt and his wife but he was their only child to survive infancy. Then, in 1642, Rembrandt’s wife died. Titus was only nine months old. After his wife’s death, the sad Rembrandt withdrew more and more into himself. He still had many commissions and produced some of his finest works during the 1640’s and 1650’s but his financial affairs were a mess. Rembrandt was deeply in debt. In 1656 he declared bankruptcy and two years later his house and all his property were sold to pay off his massive debts. 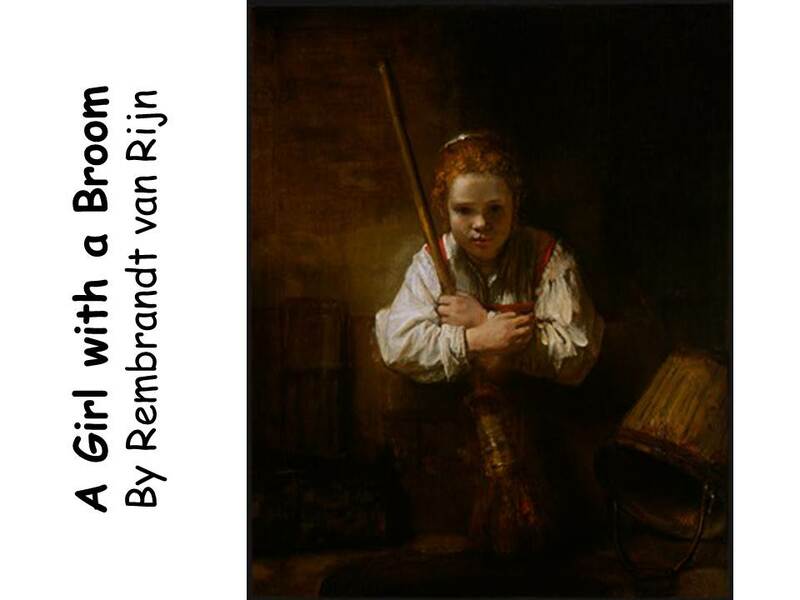 Rembrandt died a poor man, in 1669. In the 1600’s, artists were interested in the effects of natural and artificial light in their paintings. Rembrandt began painting his subjects in the shadows. He was interested in using light and shadow to create or suggest a MOOD in his paintings. Light makes the face and hands of a portrait stand out. Light reflects from metal and jewelry, and highlights silk or velvet. Both light and shadow are rich with color. Rembrandt painted many of his works in shadows. The most striking thing in Rembrandt’s portraits is his respect for the privacy of the individual. The paintings are convincing likenesses that are vivid and full of character. As Rembrandt grew older, he looked for character rather than beauty for his portraits. He loved to paint the simple people around him. His portrait of this girl brings her close to us, yet the shadows around her keep her distant. What is the MOOD of this painting? Is it happy or sad? Busy or quiet? Discuss some of the things going on in history during the 17th century (1600’s), when this portrait was painted. What did most young girls do when they grew up in Holland in the 1600’s? They became wives and mothers who cooked and cleaned for their families every single day. Families never took vacations and there were usually many children in a family. There wasn’t running water in the houses or heat, dishwashers, washing machines, clothes dryers, toilets, electric lights, hair dryers, microwaves, refrigerators, freezers or vacuum cleaners. Mothers cooked every meal for their family, so they spent most of the day in the kitchen. The family never got to take a break and go to McDonalds! What might this girl be thinking? What are her hopes and dreams for the future? Is she happy? Tired? Thinking about the game she will play when she is finished with her chores? Write a story about this girl. What’s her name? What is her life like in the 1600’s? List ways her life was different from life today. Instruct kids to remember these differences as they write their stories. Does she have a mother or father? Maybe she lives with a grandparent, aunt or uncle? Is she a servant? Does she have brothers or sisters? Does she know the artist painting her portrait? Think of additional interesting things you wonder about this girl who lived about 400 years ago. Use your imagination and create logical answers about these details to make your story much more appealing. The story should be long enough to paint a picture in words about the life and the personality of this girl, as you imagine it. Paul Gauguin was born in Paris on June 7, 1848. Paul’s father was a newspaper journalist who took his family to Peru to escape the dangerous political problems going on in Paris, at the end of 1851. His father died on the journey and Paul, his mother and sister continued on to Peru. The three of them lived with Paul’s mother’s well-to-do family, in Peru, for four years. Peru gave Paul a taste for exotic surroundings and a liking for the art of primitive peoples. When Paul was seven, his mother took her family back to France to settle his father’s family estate. While they were away, his mother’s uncle in Peru died and her relations there squandered all the money that should have come to her. The family stayed in France and Paul’s mother became a dressmaker. Paul married in 1873. He made good money working on the Stock Exchange, so he and his wife lived in style. Paul set up a studio in his Paris apartment and painted in his spare time. Paul met the Impressionist painters and bought many of their paintings. He liked their new ideas about painting and his interest in painting was growing. In 1876, Paul had a picture accepted by the Paris Salon. This was an important event for an artist who wanted to become successful at his trade. In those days, people considered you a serious, successful artist after one of your paintings was selected to hang in the Paris Salon. Paul began showing his work at exhibitions with the Impressionists, although he didn’t entirely agree with their methods of painting. In 1883 there was a slump on the stock Exchange and Gauguin lost a lot of money. Shortly after, Paul resigned from his job. He was now 35, the father of five children, and unemployed. Paul’s wife wasn’t very happy with his decision. She had married a stockbroker, whose hobby was painting, and now her husband was jobless and painting was the only thing he was doing. In 1884, Paul’s wife and children left Paris and went to live with her family, in Denmark, where they had more financial stability. Times were rough for Paul and he often lived on only bread and water. Sometimes he earned a little money by working as a bill-poster (pasting advertisements on the sides of buildings). In 1887, Paul sailed to Panama to work as a laborer on the Panama Canal. He worked twelve hours a day, shoveling dirt, but Paul enjoyed the beauty of the tropics while he was there. Paul became ill in Panama and had to return home to Paris. 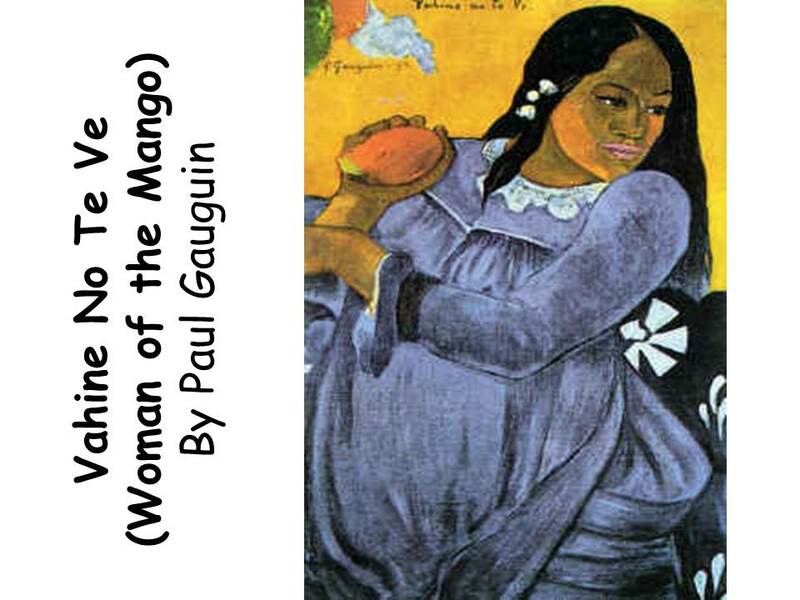 Gauguin was an arrogant and quarrelsome man, but people were beginning to like the way he painted. In 1888, Theo Van Gogh (Vincent’s art-dealer brother) organized a successful one-man exhibition of Paul’s work. Theo knew that his brother, Vincent, wanted Gauguin to stay with him in Arles, France, so he helped finance Paul’s trip there. Vincent had dreamed that he could form a colony of artists in Arles, where fellow artists would support and help each other improve their skills together. Vincent had met Gauguin in 1886 and admired his work. Vincent imagined that Gauguin would come to Arles and the two of them would work together as brothers, to develop their talents. Paul’s visit was not a success. Both men had a hard time getting along with each other. Although they helped each other as artists, the two men argued bitterly. Vincent’s untidiness irritated Gauguin and the two of them just couldn’t get along. Gauguin finally went back to Paris, after Vincent had a nervous breakdown and chopped off part of his ear. In Paris, Gauguin’s work was becoming more popular. Paul sold enough paintings to pay for a trip to the tropical South Seas. He said goodbye to his children (whom he hadn’t seen in six years) and sailed for Tahiti in 1891. His children never saw him again. Gauguin’s style evolved into very simple, solid, well-defined shapes. His colors were bright but flat, they had no shading. Gauguin sometimes used lighting (tints) without shading. His people were edged with heavy CONTOUR LINES or outlines. 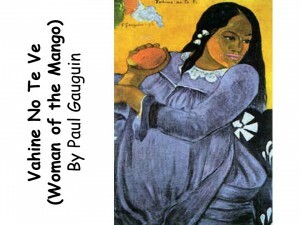 Discuss the different colors Gauguin used to paint this woman’s dress. The dress is outlined in black and white. The main color of the dress is purple (or violet) but the artist has used red and blue in several spots to make INTERMEDIATE COLORS—red-violet and blue-violet. These intermediate colors create the folds in the woman’s dress. PURPLE is a SECONDARY COLOR made by mixing the PRIMARY COLORS of red and blue. One of the EALRS (Essential Academic Learning Requirements in the Arts) for third grade is to identify and mix intermediate colors. Mixing a PRIMARY color with the SECONDARY color next to it on the color wheel (yellow-orange, red-orange, blue-green, red-violet, etc) makes an INTERMEDIATE color. This color concept can be explained when kids paint the INTERMEDIATE COLOR WHEEL for this month’s project. Tempera paints or watercolor s work BEST for this project. Color Wheel templates are available from your Art Discovery Coordinator. Paul Cézanne was born, in France, January 19, 1839. Cézanne was a shy and modest man. His father was a prosperous hat merchant, who later became a banker. Paul’s father wanted his son to choose a “respectable” profession, so Paul studied law from 1859 to early 1861, because it was what his father wanted him to do. Reluctantly, Paul’s father finally let his son try a career in painting and although he was rejected from art school, Cézanne committed his life to painting at the age of 23. Paul didn’t become famous until after his father’s death and he was dependent on his father’s money for most of his life. His ideas about painting were very different and new, and people who laughed at his work often hurt Paul. Paul was 50 years old before his work began slowly being considered successful. It used to be easy to tell a “good” painting from a “bad” one. France was the art center of Europe, and the French art critics made strict rules by which paintings were judged. If a painting didn’t follow all of these rules, it wasn’t considered “good” enough to be exhibited in the Paris “Grand Salon”. About a hundred years ago, a group of adventurous men and women began to challenge long accepted ideas about art. They began looking for new subjects to paint and new ways to paint them. Monet and Seurat experimented with ways to make painted light look real and Cézanne studied the shapes and forms of objects. Cézanne believed that a painting should not be judged by how much it looks like its subject. In his paintings, Cézanne distorted SHAPES and angles. He felt that a painting had its own set of rules that didn’t apply to how “real” objects appear. The art critics just thought that Paul couldn’t draw. His paintings got terrible reviews. Paul decided to leave the Paris art scene and refine his style on his own. Paul worked slowly and painstakingly on every painting. He made his portrait subjects sit still for hours and each portrait would require several sittings. His favorite portrait subject was his wife, who was blessed with the patience to endure her husband’s precise work methods and bad temper. As the 19th century gave way to the 20th, the critics and the people began liking Paul’s work. In 1900, Paul’s paintings were acclaimed at the Universal Exposition, in Paris. This exposition signaled the beginning of Modern Art. Cézanne’s experiments with color, line and shape formed the important artistic developments of the 20th century. Does this painting have more WARM COLORS or COOL COLORS? The entire picture is painted with COOL COLOR. Her dress is red-violet, even the warm flesh color of her face is shaded with cool blue. Does the woman in this portrait look more like a painting or a photograph? Does she look natural? Remember that Paul felt that a painting had its own set of rules so he created EXPRESSIONISTIC pictures instead of REALISTIC. Cézanne has painted his wife with her hands locked together, as an example of how he felt each part of a painting should fit together exactly. Her hands form the bottom of an OVAL that Paul created in the center of the picture. Can you find the oval shape that Cézanne has hidden in this portrait? Starting at the top of her head your eyes move to her shoulders, around the curve of her arm, to her hands, up the curve of the other arm and back to her head. Cézanne was talented enough to create MOVEMENT in this picture (cause our eyes to move around the oval of his portrait) without the viewer even realizing it! He enjoyed finding ways to incorporate GEOMETRIC SHAPES into his paintings—even if they were hidden. Compare this portrait with the portrait of Madame Renoir. Notice that the style each artist uses helps us feel a certain way about the woman in each painting. These feelings are the MOOD. Which woman seems friendlier? Which woman would you rather meet? What clues do the paintings give about their personalities? COOL COLORS create a cold personality for Madame Cézanne. She has no smile and her hair is pulled back in a stiff and plain manner. Paul Cézanne was hard to pose for. 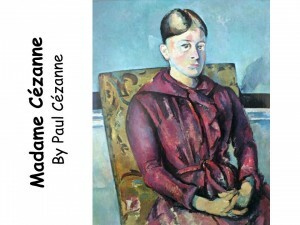 That might give us a clue about why Madam Cézanne does not seem very cheerful or comfortable. 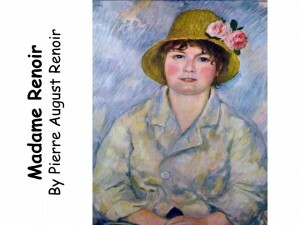 Madame Renoir has a smile and her hair is more relaxed with loose curls. The color of her skin is warmer and more inviting. Renoir is said to have invented Impressionism, spending a summer in the late 1860’s with Claude Monet, painting on the River Seine. The two artists were developing a technique for capturing the rapidly changing lighting of outdoor scenes in their painting. Money was a major driving force behind the subjects that Renoir painted. For much of his life, Renoir didn’t seem to ever have enough of it. Often, he could earn money by getting a commission (paid employment for an assigned painting) for a portrait. His agent also told him to paint Still Life, Landscapes, and traditional portraits of women, which would also sell well. But Renoir loved painting landscapes the most. This portrait of Renoir’s wife is not a glamorous painting. She seems like an ordinary woman that you might see anywhere on the street. Renoir used brushstrokes, with dabs of paint not blended smoothly, for the background and Madame Renoir’s shirt. This style of painting is called “Impressionism”. Madame Renoir’s face and arms are painted with a more solid, smooth, well-blended texture—there are not dabs or blobs of color that are typical of Impressionism. This helps her stand out from the background, she moves forward towards the viewer. She looks as if she has been in the sun. Notice the red in her cheeks, chin, nose and forehead. Her hands and arms also have a red glow and there is a sparkle in her eyes. This painting has many round and oval GEOMETRIC SHAPES. 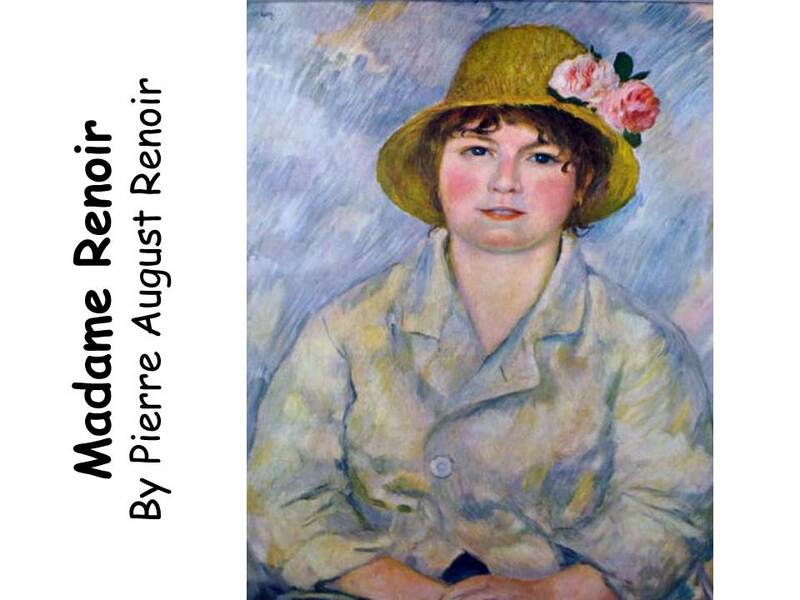 Madame Renoir’s face is round, you can trace an oval shape from the bottom of her chin to the top of her hat. The rim of her hat forms another oval and the flowers on her hat are round. Madame Renoir’s arms are a cylinder shape, much like a round tube. There is one round, white button on her blouse. Draw and paint a portrait of a woman, using round and cylinder shapes, similar to the way Renoir painted his wife.